If you don’t need a new TV or you’re simply not a fan of either AT&T or T-Mobile, Samsung kicked off its “12 Days of Deals” promotion yesterday with a Gear Fit 2 Pro gift for Galaxy Note 9, S9, and S9+ buyers. 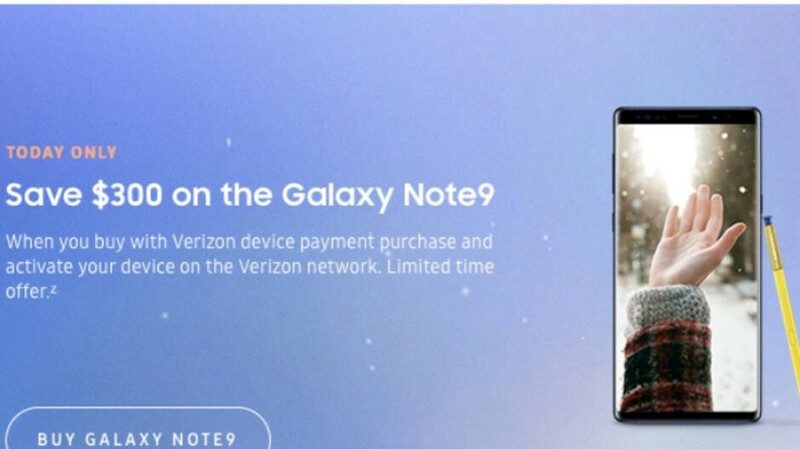 That 24 hour-only special offer is obviously no longer available, but if you’re in the market for a Verizon-specific Galaxy Note 9 variant, you can save even more money today. Namely, a whopping $300. As usual, the discount applies exclusively to devices purchased on monthly installment plans. Thus, instead of paying $41.67 every 30 days for two years, Verizon subscribers can cough up $29.17 a month, amounting to a grand total of $699.99, down from a $999.99 list price. That’s if you opt for an “entry-level” 128GB configuration in Midnight Black, Ocean Blue, or Lavender Purple colors, with 512 gig versions also sold at a cool $300 discount overall for $39.58 a month ($950 in total). The same exact deal can be found at Best Buy with no specified expiration date, and although Samsung offers no savings whatsoever for Sprint customers, Best Buy does let them shave $300 off the Note 9’s price with payment plans too. Meanwhile, if you’d rather get an affordable Android slate instead of an ultra-high-end phone, Samsung offers the $200 Galaxy Tab A 8.0 bundled with a free charging dock (normally worth $50) today only. That’s not exactly the deal of a lifetime, but it’s definitely better than nothing. Forget those "24 monthly credit" discounts. They're just the new 2 year contracts that supposedly don't exist anymore. Ugh. Verizon. Decent deal though. Except that that these aren't monthly credits. You could wait til you receive your first monthly charge for the phone and pay it completely off for 700. These are much better deals than the monthly credits as you get them up front from the very beginning. Nie deal VZW. But mine was still better, because it was a BOGO. But qow, $300 off for the holidays is a very nice option, on the best network. Can you hear me now!